It may be difficult to lower cholesterol if there is a problem with your thyroid gland. A connection has been found between an under active thyroid and the ability of the body to regulate cholesterol. Hypothyroidism is the second leading cause of high cholesterol after diet. Further research has shown that a malfunctioning thyroid can lead to high cholesterol and thwart even the best attempts at lower cholesterol levels. The thyroid gland, which is located in lower neck area just above the collar bone, is responsible for controlling metabolism in every cell. The hormones produced by the thyroid gland also regulate the production of cholesterol because of their role in brain cell function, liver function, and the entire body. A malfunctioning thyroid gland can cause the liver to produce deadly levels of cholesterol. Endocrinology is the science that deals with all of the glands and hormone production in the body. Doctors of endocrinology, called endocrinologists, estimate that 27 million Americans have an overactive or under active thyroid gland. Many other conditions that are being managed with prescription drugs could possibly be the result of the improper function of the thyroid gland. Thyroid function should be tested before determining the cause of high cholesterol in addition to traditional cholesterol screenings. Dr. Paul Jellinger is president of the American College of Endocrinology. He explains that the liver usually absorbs excess cholesterol from the blood stream so that there is not a build up of the excess in the arteries. When thyroid function is low, that process doesn’t work as well. 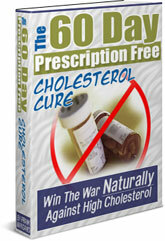 If you have already determined that your thyroid gland is functioning properly and still struggle with high cholesterol then you need to order a copy of The 60-Day Prescription Free Cholesterol Cure. In the book you will learn more about cholesterol testing and how to create your personal plan to lower cholesterol naturally.